Royal Air Force Volunteer Reserve 12 Sqrn. Arthur S Needham was born on 17 December 1910 and his birth was registered in Wandsworth. An A S Needham is listed in the phone books, from 1941 to 1946 at 'Ingleton' Wilmot Way although this period includes several years after Pilot Officer A S Needham was killed in action. Arthur Sidney Needham is shown as residing at Ingleton in the 1938 Electoral Register. Arthur, or Sandy as he was normally called was the son of Arthur Edward and Beatrice Needham of 74 Wilmot Way. He was the husband of Vi , born Florence Maud Mann , of Toorak, Victoria, Australia. Sandy was educated at the Archbishop Templar School, in Lambeth, where he gained a scholarship to study art, but he was not allowed to take it up, as his elder brother had not obtained one. He did some very credible water colour paintings, and was very good at drawing. He never followed an art career, and instead he trained in commerce, and gained a place at the Commonwealth Bank of Australia, Old Jewry, where he worked in French affairs, being fluent in that language. In his leisure time Sandy liked to swim, listen to classical music and also work in the garden. He ran with the South London Harriers, and with Bill Hogg, ran the 2nd. Streatham Boy Scouts Group. It was there that he met Vi, a lady cubmaster, who was to become his wife. 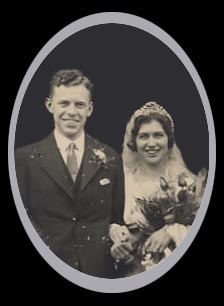 They married on 16 February 1935, at St. Margaret's, Streatham Hill. Their daughter Maggi was born in 1937 at Ingleton, Wilmot Way, Banstead, where they lived after their marriage. The property was down a cul-de-sac and ran crossways to the end of Sandy's parents' garden, as they lived at 74 Wilmot Way. Maggi was the only child, as the war then intervened. At the start of World War II, No. 12 Squadron departed for France as part of the Advanced Air Striking Force equipped with Fairey Battles. In May 1940, Fg Off Garland and Sgt Gray, his observer, led a flight of aircraft in an attack on a vital bridge over the Albert Canal. All of the aircraft were shot down by fierce enemy ground fire, but one end of the bridge was destroyed and both Garland and Gray were posthumously awarded the Victoria Cross, the first of the war for the RAF. After the British withdrawal from France in June 1940, the Squadron began night attacks on enemy shipping and re-equipped with Wellingtons. After a variety of short deployments within the United Kingdom, Binbrook, Thorney Island, Eastchurch and again Binbrook, the Squadron finally settled in Royal Air Force Binbrook in Lincolnshire, during this time, carrying out night operations against Channel ports. In October 1940, 12 Squadron was re-equipped with the RR Merlin-engined Vickers Wellington Mk II and spent the winter training for night bomber attacks. The 10th April 1941 saw the first raid, against Emden, the beginning of sustained operations against German industrial targets. The Squadron, now a part of No 1 Group, flew on a variety of missions from attacks on the great capital ships Gniesenau, Scharnhorst and Prinz Eugen, to raids on Berlin. In November 1941 the Squadron's operations record headed the list for all of 1 Group, and a year later 12(B) Squadron took part in the first 1000-bomber raid where it mustered an impressive 28 aircraft. Between July 1941 and June 1942, thirty five aircraft within Serial Range Z8567 - Z8601, including Z8595, were delivered by Vickers (Weybridge.) By September 1942, 12 Squadron was part of No 1 Group Bomber Command and were preparing to convert to Avro Lancasters. 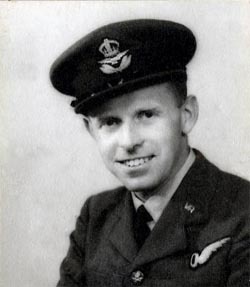 Pilot Officer Arthur Needham was killed on the night of 4th/5th September 1942 in Vickers Wellington II, Z8595 - PH-? Piloted by Sgt T Smith. The aircraft took off at 00.25hrs from RAF Binbrook in the Lincolnshire Wolds (7 miles from Market Rasen) for a raid on Bremen. Other than the Pilot, Needham was the only commissioned officer within the crew, and it is very likely that he was Navigator on this flight. Failing engines caused the aircraft to turn back at the Dutch coast, but despite jettisoning the bomb load, height could not be maintained and the Wellington ditched at 02.30hrs some 20 miles off Cromer, Norfolk. The pilot, Sgt Smith, the sole survivor, was picked up by HMS Hambleton after spending three hours in the water and on reaching port he was admitted to Felixstowe Hospital. 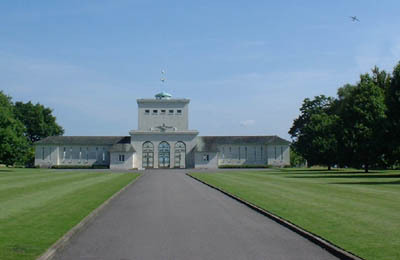 His crew have no known graves and are commemorated on the Runnymede Memorial. They were P/O A.S.Needham. KIA Sgt F.Smith KIA. Sgt R.W.L.Mills RCAF KIA. and Sgt W.Anderson KIA. The raid on Bremen was carried out by 250 aircraft of bomber command, of which 98 were Wellingtons. Four Wellington's were lost and only one of these - Z8595 was from 12 Squadron making it one of the last (if not the last) Wellington casualties on operations, from this Squadron. On September 25th 1942 the Squadron, newly equipped with Lancasters, moved to RAF Wickenby where it remained for the rest of the war. As a result the main 12 Squadron memorial is located at Wickenby and the Squadron is not principally associated with Binbrook from where it's Wellington operations were flown. Mrs Needham never came to terms with the loss of her husband. Her daughter Maggi says that even after a very happy second marriage nine years after his death, Arthur was never far from her mind. Vi Needham died in 1984 in Tasmania. Maggi continues "Sandy was a much loved man by all who knew him. Very gentle, and I have been told this over and over again. I do remember him well, especially when he came home on leave, and we sometimes followed when he was training, like the time he was at Bude, in Cornwall. He also went to Canada to train for a while. But a lot was taboo to talk about. Lancaster bombers were often talked about, so I always thought this was my father's plane, but I now understand that the squadron used Wellingtons all the time he was involved, and Lancasters came later. Sandy was never happy going on bombing raids, and said he had to think about killing rats, not people. I can also remember him being against cutting down trees, so he was an early environmentalist". Updated 13 Nov 2008 with Photos and personal details.